The SonicBar is a stereo monitor speaker that can be used in a variety of locations, such as attached to the SEQUENZ Standard series keyboard stand, or placed on the floor or a desk. Since the speaker is specially voiced for close proximity to the performer, it implements natural feeling monitoring with a high-quality stereo image. The unit is equipped with two stereo inputs, allowing two synths to be connected for monitoring. It is also equipped with one thru out jack, so you can monitor your own performance while also outputting it to an external PA. In addition to a volume knob, two front panel knobs allow tone adjustment. An external input jack and a headphone jack are also provided. 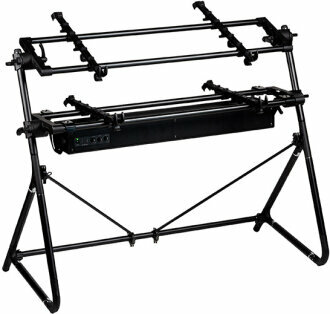 When attaching the unit to the Standard series of keyboard stands, users can adjust the height, position, and angle to fit any playing position without having to use a screwdriver or any other tool. The SonicBar can also be installed reversed front-to-back, so in a cafe or a small live performance venue, the speakers can be pointed toward the audience for an immediate, compact performance setup. Note: Pictured with Sequenz Standard Keyboard Stand, not included. Same Day Music is an authorized dealer of Sequenz products. Available until 11 PM (EST) today. Mention special code 20L-RWFG when you call.